in tip-top shape all season long. For all the joys of backyard living, it seems one of the only downfalls can be dirty outdoor furniture. Anyone who owns white shorts or pants knows the great disappointment of sitting in a patio chair, only to discover upon standing that their chair was less than clean. Dirt might seem like a minor inconvenience. But over time, grit can damage the structural quality of your outdoor pieces. Keeping your furniture clean can impact the lifespan of your outdoor furniture in a dramatically positive way. Fortunately, there are many tricks of the trade to protect and clean your furniture, keeping it looking beautiful for years to come. Below, you’ll find resources and techniques to clean outdoor pieces by material, ranging from wood to metal to plastic. 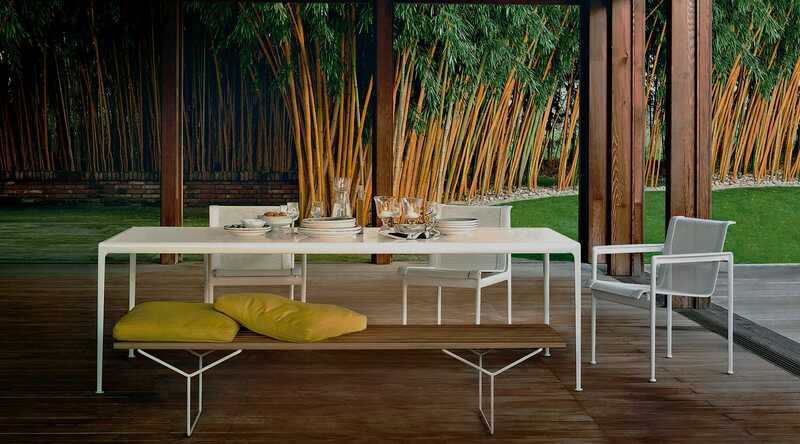 First, there are some strategies for all outdoor furniture that we recommend, regardless of the material. The most basic advice we can offer to even the most reluctant cleaners? Invest in covers for all of your furniture, regardless of the material. The sun, water and dirt can all lead to bleaching and other damage, which is easily avoided with a waterproof slipcover. Plus, it makes seasonal cleaning a breeze. Even after protecting your furniture from the elements, we also recommend that owners clean all outdoor furniture four to five times per year, typically at the start of each season, and twice during the summer. If that sounds like a lot of work, don’t start to worry yet. Cleaning patio pieces is much easier than it might seem, and doesn’t require renting a power washer. In fact, we don’t recommend using a power washer at all unless the manufacturer specifically indicates a piece is power-washer-friendly; this style of cleaning can damage many materials. Following these three easy steps might seem obvious. But if you embark on a deep clean before giving your furniture an initial dust-off, you may find that you have twice the work to get a thorough clean. Now, for the material specifics. Check out each section as a guide to clean different materials for your outdoor furniture. (And be sure to check out our Outdoor Furniture Guide for more info about these materials.) You’ll be a cleaning professional in no time—and you’ll never have to worry about a guest sitting on a dirty patio chair again! Wood furniture can seem like the most challenging surface to clean; with its varied texture and gorgeous finishes, it can be nerve-wracking to come at a wooden table with a bucket of water. But there are many cleansers that make cleaning wood pieces a breeze. After dusting your furniture with a damp cloth, you can apply a gentle cleanser to give the wood a deep clean. An oil-based soap, such as Murphy’s Oil Soap, works like a dream on wood pieces, since it’s free of harsh chemicals and easy to use. If you would prefer trying a DIY wood cleaner, you can find many options with just a quick online search. Work in small sections with the product to make sure the surface is thoroughly cleaned; wood has an open, occasionally rough texture that means it requires a little extra elbow grease to get a thorough clean, but these cleansers come with a big payoff. For those cleaning enthusiasts who are looking to make their wood pieces extra squeaky-clean, a toothbrush will excavate dirt you didn’t even know existed. But this isn’t typically necessary for casual patio users. If your wood furniture develops any mold during cooler, wetter months, allow the piece to dry out before approaching the spots. Then, scrub the surface with a dry brush until the mold flakes off. After the mold is cleared, check for any issues and allow to dry again fully before performing further cleaning. 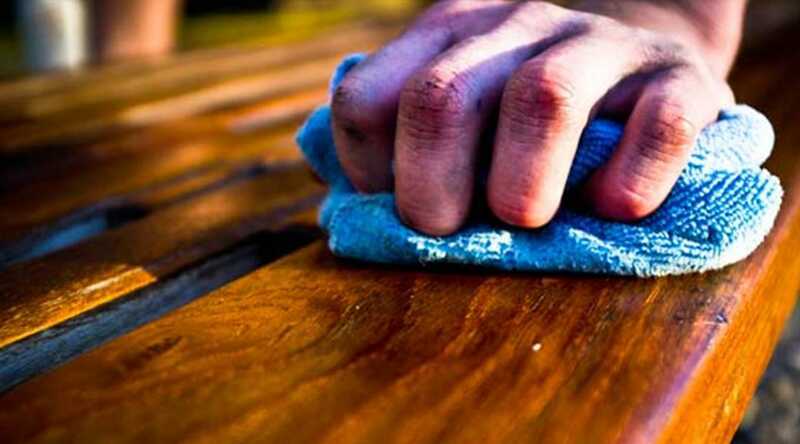 During peak-use seasons like spring and summer, try to wipe down wood at least once a week with a damp cloth to prevent dirt and dust from impacting the appearance of the materials. Want to give your older wood pieces a new lease on life? You can give it the royal treatment by sanding and staining the piece. This also allows you to change the piece if you’re updating your color scheme and want lighter or darker wood. The biggest risk for any outdoor metal furniture is rust/oxidation. Over time, rust can create a real problem for any exposed metal surfaces and can even break down furniture. Luckily, it’s easy to prevent rust, which is caused by water damage. Waterproof covers will generally take care of any regular seasonal rain or dampness; just make sure your covers are long enough to protect the bases or feet of chairs and tables. Even if you’ve got some rust, there’s no need to call your furniture a lost cause. If rust is discovered early, there are many solutions for removing it. Simply brushing the patchy orange spots with a simple DIY mixture of vinegar and water, applying a metal cleaning material, or even a steel wool pad will work to keep furniture rust-free. As always, start with a quick wipe-down with a damp cloth—be sure to avoid any rusty spots—then deal with any oxidization. After this initial clean and rust-clearing, a general clean is practically effortless. Use Soft Scrub (or a similarly formulated product with a very mild exfoliant) on a soft rag to remove dirt or scuff marks. In a pinch, you can even use dish soap mixed with water to cleanse metallic surfaces. If you own painted metal pieces, be sure to fix any small chips. You can search for the appropriate color of touch-up paint, then paint over clean damaged areas. As always, be sure to check manufacturer’s directions for any brand-specific instructions with these minor issues. Perhaps the easiest of all surfaces, plastic and all-weather wicker furniture is low-maintenance and season-friendly for any climate. Cleaning for these pieces is simple: After the initial dusting, use a gentle cleaner that is free of chlorine, bleach or scrubbing/abrasive particles. It’s important to check the labels of any product before you use it on plastic; corrosive ingredients will deteriorate and damage your plastic pieces. To stay on the safe side, dilute your product with water before you use it on any plastic surfaces. You can even use WD-40 with a soft cloth, which will restore shine and make plastic look brand new. For the patio junkies who want to take that extra step, you can protect plastic furniture with a layer of car wax to keep the elements from damaging the shiny surface. The comfy cushions on your outdoor couch deserve a clean, too! Be sure to check the cloth tags for any manufacturer’s instructions specific to the brand or fabric type. But here are a few extra tips to keep outdoor upholstery clean. If you have natural fabric cushion covers that can be zipped off, wipe the surfaces first, then launder on a gentle cycle. Of course, always check product tags to ensure it can be cleaned in a washing machine. For synthetics and waterproof fabrics, wipe down with a damp cloth first to clean dirt and dust. After removing dirt, use a solution of diluted dish soap and water to clean deeply without damaging fabric. Occasionally, especially if the fabric has been left outside in the rain or damp, upholstered pieces can mold. Not to worry—just scrub the mold with a dry brush after dusting the surface with the dry cloth. Then wash according to the specifications of the fabric type. Keeping your outdoor furniture clean doesn’t have to be intimidating; a seasonal cleaning schedule can help you keep your beloved patio sofas, chairs and tables fresh all year ‘round. Even if you’re not a big cleaner, it’s easy to give furniture a quick scrub-down in the warm months and allow the pieces to dry out in the sun. The perfect end to an afternoon cleaning furniture? Relaxing in your backyard with an umbrella in your drink, admiring your hard work.